We reached India just in time for Navratri celebrations. My mom, as always, had elaborate plans for the kholu. Navratri was a total relaxation time for me as i had nothing else to do but to eat all the snacks which Vidhya and mom brought back from their trips to the neighbourhood. My mom had set up a big Kholu occupying our entire living room and she had also done a massive Radha-Krishna rangoli. It was awesome and as i had written before, it deserves a separate post of its own. 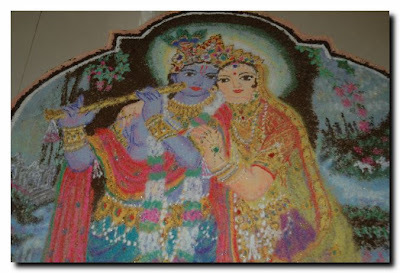 Below are some of the pictures i had taken of this awesome rangoli. 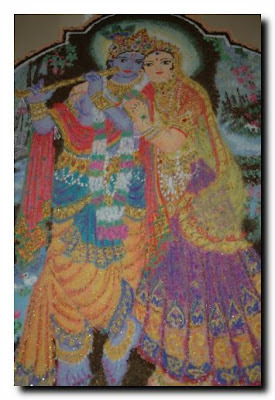 My mom had a picture as a reference for this rangoli. She first drew the outline by chalk and then filled in the gaps with different coloured powders. 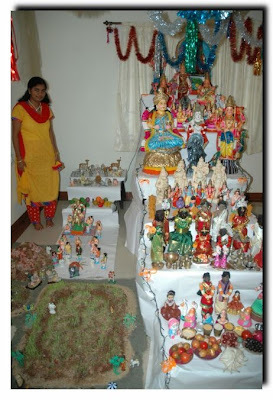 There was also a mini-kholu on the side which contained, according to my mom, dolls which couldn’t be accomodated in the main kholu. 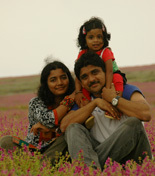 There were reporters from some local daily who had come to take photographs for a competition for the best Kholu. Well, we didn’t hear back from them, but i would definitely like to see the better kholus. 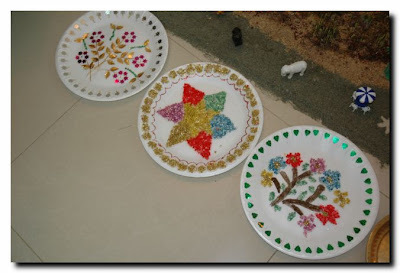 She had also prepared decorated plates for display in front of the kholu. These were made with lot of chumkis, grains soaked in coloured water and fevi-kwik! 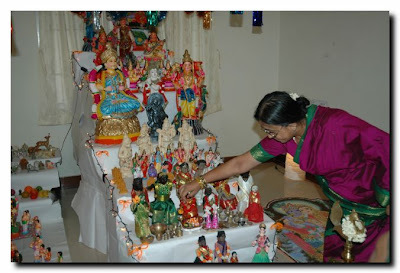 .The 9 nights festival of Navratri begins on the first day of Ashwina of the bright fortnight.